Over five years ago the South Island of New Zealand was decided upon as the ideal starting point for my post-military extended world travels. Magnificently steep glaciated mountains, vast and exotic forests with aquamarine colored rivers and lakes, all surrounded by nearby ocean beaches… perfect. The 60k Kepler Challenge is a 100% singletrack trail race located in the heart of some of the best wilderness I described the South Island having. After arriving in Christchurch November 8th, Maggie, my wife and Felix, my 22-month old son, were headed south towards Te Anau and Fiordland National Park for the Kepler Challenge which took place December 1st. We biked 2 to 6 hours a day camping along the spectacular winding roads of New Zealand. I would wake up and hit the trails, or as they are called in New Zealand, tracks, for my training. Unlike my last race in October, the Grindstone 100 Mile, which has 23,000 feet of climbing on very rocky technical trails, the Kepler has 4,700 feet of climbing, most all of which is covered in one 10-mile stretch of the 37-mile course, on smooth, wide, very fast, California like trails. The Kepler Challenge’s elevation profile. I scrambled to quickly inject some leg speed via flat tempo runs in preparation for Kepler, which couldn’t be more different than my training this year for the San Juan Solstice, Speedgoat, Run Rabbit Run and Grindstone. My energy levels after running and biking all day was a bit low and I was eating like a starved teenager, which was kind of fun. You could catch me on the bike eating an entire bag of cookies, a New Zealand Meat Pie, or my favorite, peanut butter-dipped chocolate. The nearly three-week journey via bike to Te Anau was epic in itself, but the race would prove to be just as amazing. As Ian Sharman covered in his recent article, Kepler is steeped in 25 years of tradition and is truly a very special gathering of Kiwis who love trails. I think it is safe to say Kepler is New Zealand’s Western States. In the race packet I received a 172-page book covering the history, lore and stories about Kepler. The Kepler is a major part of Kiwi culture and it was amazing to be around such a legend of a race. This year’s race, with 450 runners, had a bit more competition than in the last several years. Besides knowing Vajin Armstrong, who had won this year’s American River 50 mile in 5:53, I didn’t know anything about any of the other racers. 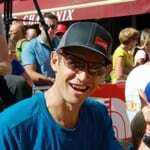 Grant Guise, who runs for Salomon, owns a running company in New Zealand and hosts the running website Backcountryrunner.co.nz on which he previewed Kepler’s men’s race. In addition to Vajin and myself, Marty Lukes, a three-time Kepler winner and race legend would be running, Tony Fattorini and Andy Tuckney (3rd at TNF100 Australia behind Ryan Sandes and Vajin) would represent Australia and ultra legend Martin Cox from the UK would be the big players in this year’s race. The first 6k was fast. Vajin and Martin were in the front with Marty, Andy and I running close behind. Unlike in the US, I was the only one I saw all day carrying a hand-held water bottle, where everyone else around me just drank at the aid stations. The next 8k, where a majority of the climbing took place, went pretty well for me. I kept things under control running relatively comfortable up the very friendly switchbacks and mostly smooth trail up to treeline. Just before treeline I passed Andy to move into third behind Martin and Vajin who were running together just a couple minutes ahead. As soon as we hit treeline the wind became a huge factor. I’m not good at gauging wind speed, but it had to be blowing over 40 miles per hour with nasty gusts. My first reaction was being nervous that the race might be canceled, or turned around, but luckily that wasn’t the case. Making our way to the Luxmore Hut at 8-ish miles I was stunned to see and hear the helicopter flying just above. Kiwis are nuts about crazy extreme sports and flying and using helicopters in the mountains is commonplace. Kepler isn’t the only race in New Zealand where they use helicopters, but to be flying around in hurricane-like wind, in the high alpine, with misty rain and low visibility… unreal. I would later find out from Maggie that the race announcer at the finish would report that the helicopter had blown over another racer and how that was just part of the race. The helicopter would fly right next to runners, awesome. At the hut we had a spot check of our mandatory gear: hat, gloves, two thermal shirts, coat, long underwear, rain pants and space blanket, and we were off. Andy was out before me and I was back to fourth. Up and across the stunning ridge we went. As expected, the views were unreal… looking down at the lake and the surrounding mountains was a special experience. The helicopter zooming around with the crazy weather was just icing on the cake. At the beginning of the very steep descent, which included 160 stairs, I was maybe 90 seconds behind Andy and 3 or 4 more minutes behind the leader, Vajin. Martin had fallen off the lead and was passed by Andy on the way down and then by me. Martin was suffering some stomach issues when I passed and not having his best day. Next came the 32k tempo, yeah over half of the race is a gradual or flat, super fast trail run. While I can run some fast, flat trail running, I just wasn’t ready for 32k. My energy levels were fine and I was taking in 200-300 calories an hour of Vitargo. I maintained a 2:00 to 2:30 gap on Andy the first 20K and was 6-8 minutes back from Vajin, but I wasn’t reeling the competition in. I would have rather had the course take a detour up the mountain, but, instead, I battled physically and mentally to hold on to the fast pace. I had decided third place would do for the day, but that I had to keep pace, as who knows what will happen up front and to make sure no one lurking in the shadows came from behind to ruin the day and after a few look backs on the descent, I was pretty sure I didn’t have company for at least 5 minutes back. But still, I was running a bit scared and having a deeply spiritual solo journey. I was doing my best to let go of my fears, rely on powers outside of me know that everything is working as it should. At about 4:17 into the race, I looked back and saw Marty right behind me. I was shocked and frustrated. I picked up the pace and put a few seconds on Marty into an aid station at 4:20. At about 4:30 something, Marty passed. Marty was conversational, but due to my bad hearing, being behind him and his Kiwi accent, communication was pretty much useless. Marty was also doing all he could to keep pace and I could have passed a few times on the slight up hill bumps, but on the flats, I was maxing out. I devised the plan to just hold on, keep contact and at 4:48, I would give everything I had, pass and hold on for dear life. At the pace we were running, I think we would come through the finish in just under 5 hours, with Andy probably around 90 second ahead of us at the time. Then I let Marty have a few seconds on me… then I fell apart. With 5k to go I began to verbally grunt, moan and turn into an ogre attempting to run fast. Marty must have slowed down as well, but not quite as much as me. I finished in 5:04, Marty 5:02, Andy 4:59 and Vajin in 4:53. Yeah, losing that podium spot so late in the game is a heart breaker, but I gave it my all, in a less-than-ideal training lead-up to the race. Kepler was a spectacular and special event I will never forget. As Grant Guise pointed out to me over a beer a few nights before, this race is truly a gem with real heart and soul and being able to take part, regardless of performance, is priceless. I can’ t wait for my next New Zealand run and furthermore race. Nice report and a great effort out there while traveling and bike touring with the family. The race is just one part of the whole experience; sounds like an amazing trip. Brings back fond memories (except the part when Marty Lukes passed you… that brought back painful memories from my own race. He's a tough runner!). i would love to hear more about the bike touring with a young'un… i'm very intrigued by the idea with ours. blog? extra write-up? thanks! I traveled extensively in New Zealand and the hiking and backpacking is amazing. I did a bit of biking and at the very least would caution one in terms of biking with a kid and I would be very curious to see if Jason has felt unsafe biking. Great write up – I'm really happy to see this race getting some attention on iRunFar – this area is gorgeous, and New Zealand as a whole has the potential to be ultrarunner mecca. Wonderful race report Jason! Great, gutsy effort. You guys are truly experiencing life together. As Kristin Z requests, it would be fun to hear more of your travels. Keep the reports and updates coming. You bet Kristin! jasonschlarb.com and for my wife's perspective, magggieschlarb.com Felix loves traveling, backpacking and bike touring… honestly. Thanks Galen. It was a great race and adventure and I look forward to a whole summer of trail/track running in New Zealand. Honestly, yes, I have moments of feeling unsafe biking on the roads. With that said, I feel un-safe anytime I am on a road, rather it be in a car, running or biking. In NZ, the shoulders are narrow BUT, in the south island of NZ there isn't much traffic (or people)and more than anywhere else I've been in the world, people give us tons of space when they pass. You are correct, NZ has an amazing network of tracks/trails that are very well maintained and appreciated. The terrain, fantastic. Steep mountains, ocean, fiords, dense forested jungle like foliage and lastly tons of lakes, rivers, waterfalls and creeks. Perfect!